Widgets, shortcuts and fuzzy kittens. One of Androids most powerful, appealing and functional pieces is its Home Screen abilities, offering you a place to completely customize the look, feel and operation of your device. The default Home Screens go beyond allowing you to change the background and put links to your apps, going so far as using Widgets to allow you to perform actions without having to launch an app. Your Home Screen is the location you end up when you press the Home button on your device. Beyond the default functionality, you can actually install other Launchers that allow you to completely replace the Home Screens with other layouts and functions. Although I admittedly have no love for Facebook as a service, I was completely impressed by their initiative to introduce their own Launcher made your home screen a very unique Facebook experience. It was a flop, as far as that goes, but the initiative was absolutely worth taking seriously as I would not be surprised if they make another attempt in the future. Of course, you can change the background image, or wallpaper, long press on an empty spot on your screen and you will be provided option to change it. 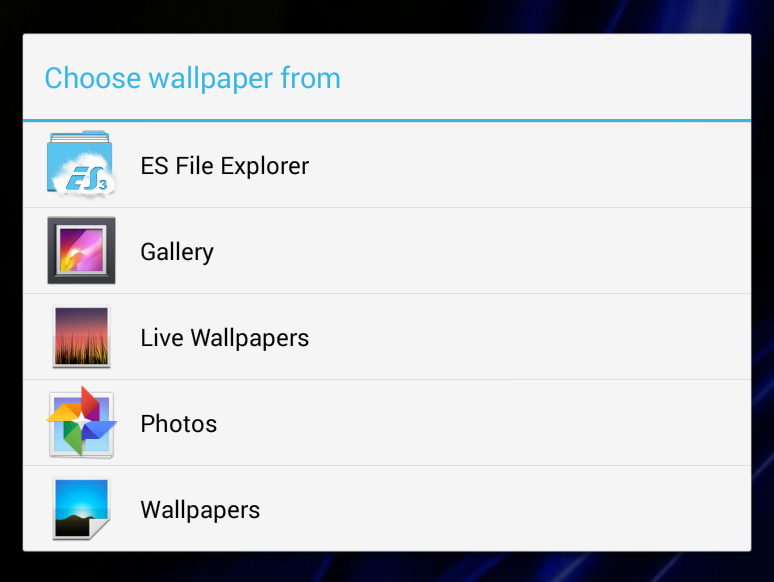 You will be offered a set of pre-built wallpapers, Live wallpapers - which move and can be interacted with, or choose from your own images of your children or fuzzy kittens. Shortcuts fall into a few categories, first, you can place an application shortcut, this is simple stuff that you've seen on every computer system you've touched before. After that, you can put shortcuts into various settings for the device, shortcuts to people in your address book, to make install calls or sms. Some older versions of Android allow you to place the shortcuts by long press on the home screen, but your best bet is to long press on the app icon in your Application Menu, which will pop it onto your Home Screen, drag to desired position. Then we get fancy, with the assistance of other apps, such as Trigger (NFC), you can actually place a shortcut into a specific Activity within an app. This means that instead of launching an app normally, you can tell it to go to a specific function, for example, instead of opening Chrome normally, open straight to your bookmarks page. Better example, instead of opening Google+ normally, open straight into your Circles page or Photos. This type of functionality is handled through what we call a Widget. This is where Android becomes truly customizable and powerful. When you really break it down, a widget is a mini version of an app that runs within a predefined block on your home screen. This can be as small as one app icon or as big as your entire screen. The most common Widget is the clock widget. Some clocks include weather or other info, many of them let you choose what info to include and almost all have a few designs to choose from. Next popular is probably a music widget. Calendar, email and other messaging widgets are very handy for quick glance view of your communications. These widgets do not usually let you compose new calendar events or messages, but reading them and deleting/archiving is a very common task, then, opening the full application to perform the bigger tasks. Other common widgets include toggles for common settings, such as changing your audio volumes, screen brightness and turning on and off your wifi. 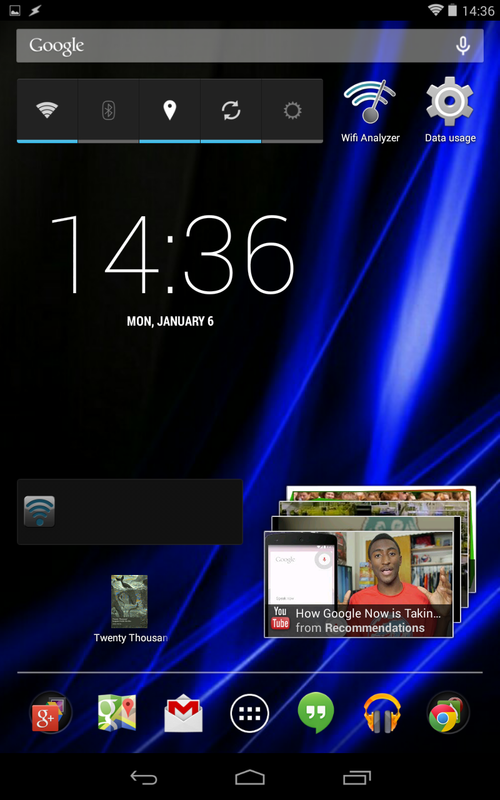 My favorite widgets are the fully customizable ones that allow you to do so much more, such as Zooper Widget. Although I found the developers behind Zooper to be a little rude the one time I contacted them for advice, the product is amazing, which is why I wrote about it here. The bottom line, using Zooper or similar, you can create a customized Home Screen experience that is contoured to your wants and needs while being absolutely unique to you and your device. Remember, do not ask what the device can do, figure out what you want and ask how to make the device do it. I keep saying Home Screens, plural... The newest Android provides you 5 screens, with the default being screen three, so you can swipe two left or two right. Other Launchers have varying settings from one to infinite, usually letting you decide how many is right for you. They also offer more and varying effects in the transition between screens. Default Android has a pleasant enough simple transition where content slides out the side of the screen while the incoming content slides in from the other side of the screen. One transition that other launchers offer is the same as the default Android app menu, where content still slides in or out the left side of the screen, but content on the right fades in or out expanding in or shrinking out of the center of the screen. When last I used GO Launcher EX, I recall there being over 20 effects to choose from, including one that made the screens look like a spinning cube. I wish to warn you now, this can be an endless rabbit hole of possibilities, you may end up spending many hours customizing your screens; please do not be afraid to do so, these fun little tweaks are partly why Android is the number one mobile OS in the world. My personal strategy, a functional theme per home screen. Main screen has clock, weather and most commonly used apps. Another screen used for messaging and communication, a third screen for utilities and settings, fourth for entertainment and so forth. But that is absolutely what works for me, please find your own style and setup. Willing to share a screenshot of your home screen?